How much do you love open shelving? 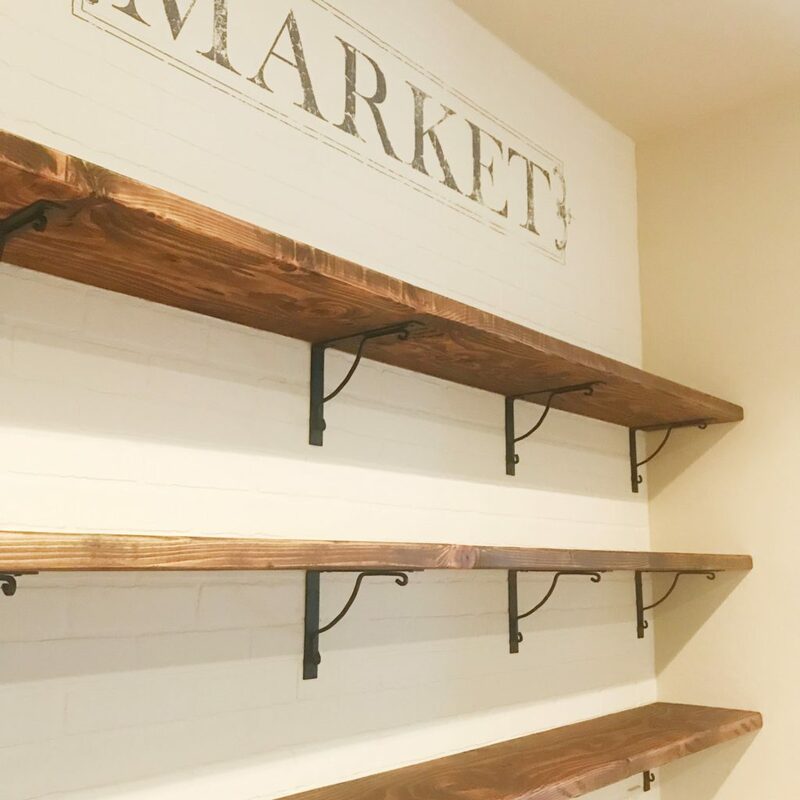 If the answer is…SO MUCH…then keep reading because I’m going to tell you all about our open shelving and give you the How-To. So lets dive right in, you ready? you might remember how I came to the decision to rip out some cabinets and put in open shelving. 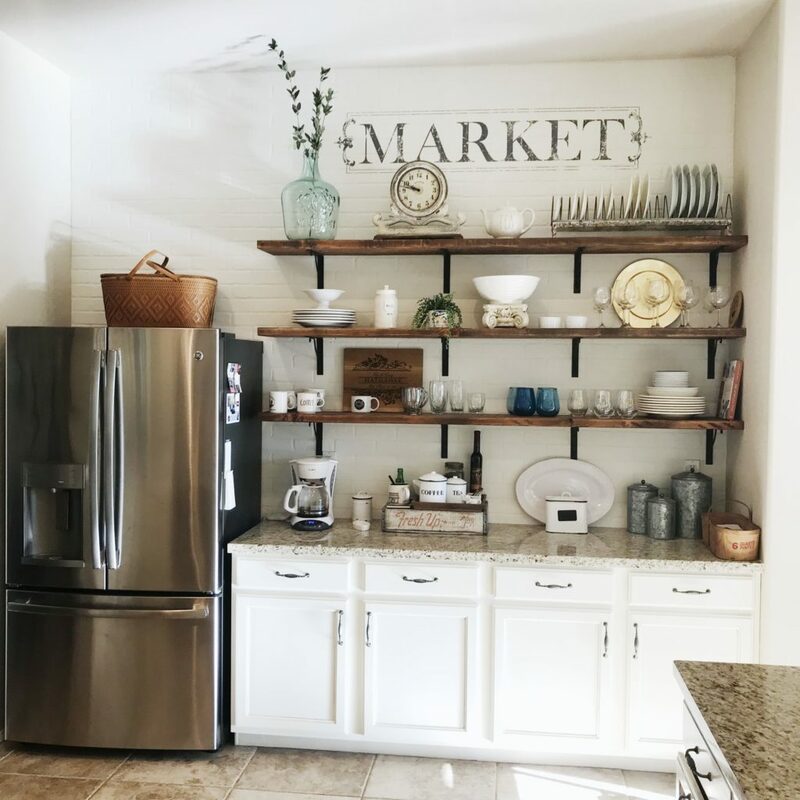 I was laying on the couch watching TV and looked over at this wall of cabinets and refrigerator and said to my hubby…”What if we took those upper cabinets down and put open shelving on that wall?”, to which he replied, “I don’t hate it.” Yep…that’s how it began. Most of my projects are like that…they just pop into my head and I can’t stop thinking about them. The best part is when we finish the project and I can see that it’s exactly how I imagined it. The first wall of kitchen cabinets. 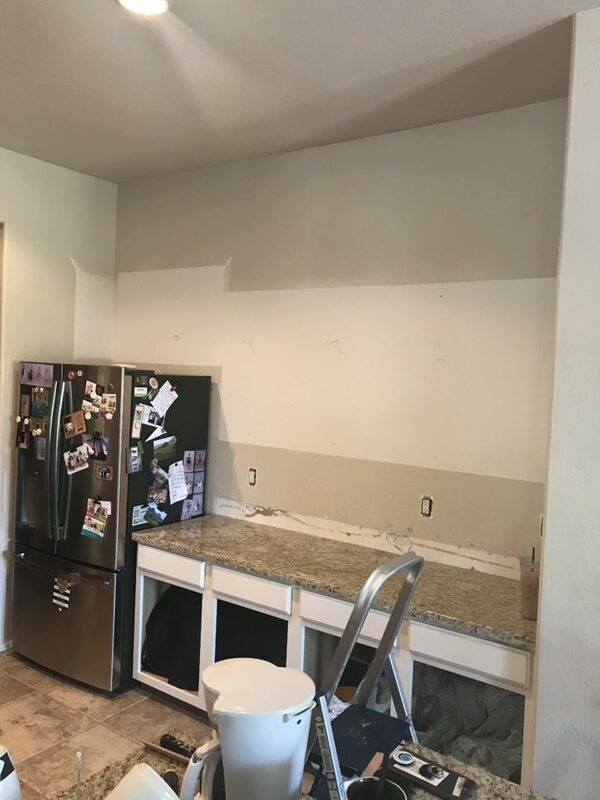 Lower cabinets get paint, upper cabinets get removed to make the perfect wall for open shelving! We bought this house almost 2 years ago. It’s 14 years old and, as with most builder-grade homes in Arizona, it has little to No character or charm. If you want a charming home filled with character in Phoenix, and you’re not building a custom home, then you’re on your own. 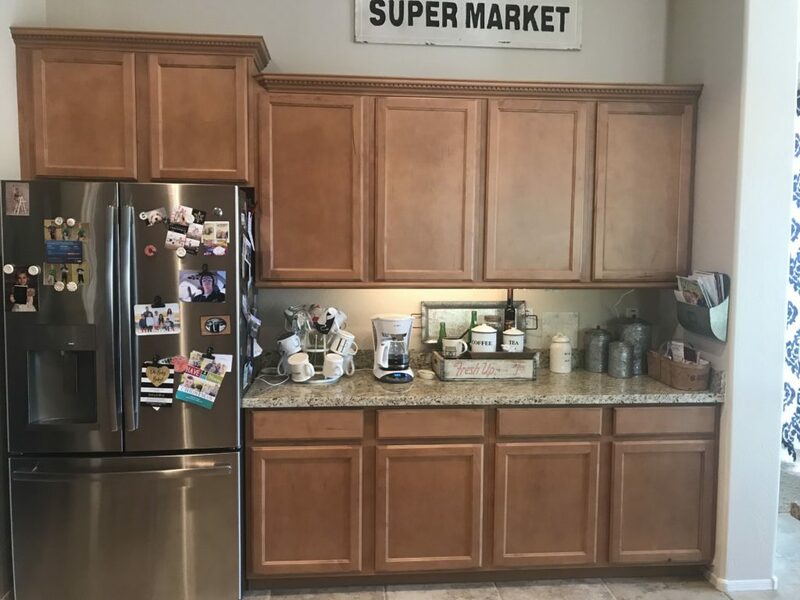 Removing these cabinets was the very first step of our Open-Shelving idea….but behind those cabinets is just a plain old ordinary wall made from drywall and texture. Blah! 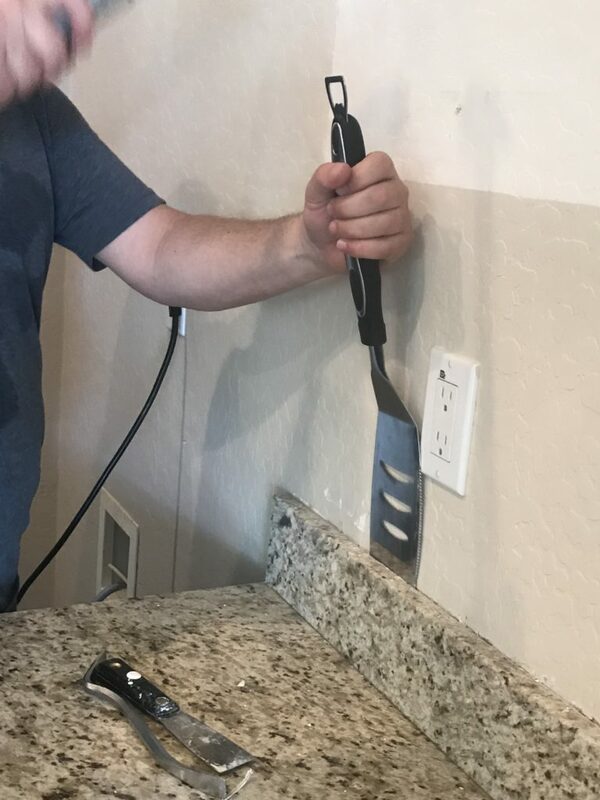 Barbeque Tool also functions as a backsplash remover! so I thought why not put some brick on that wall…it can’t be that hard and it would really add some character. I added some brick to a fireplace in our rental home in Washington and it was fabulous, so fabulous in fact that even though it was installed so that it could easily be removed, we left it when we moved out and they loved it. Anyhow…back to Az Cindy…. 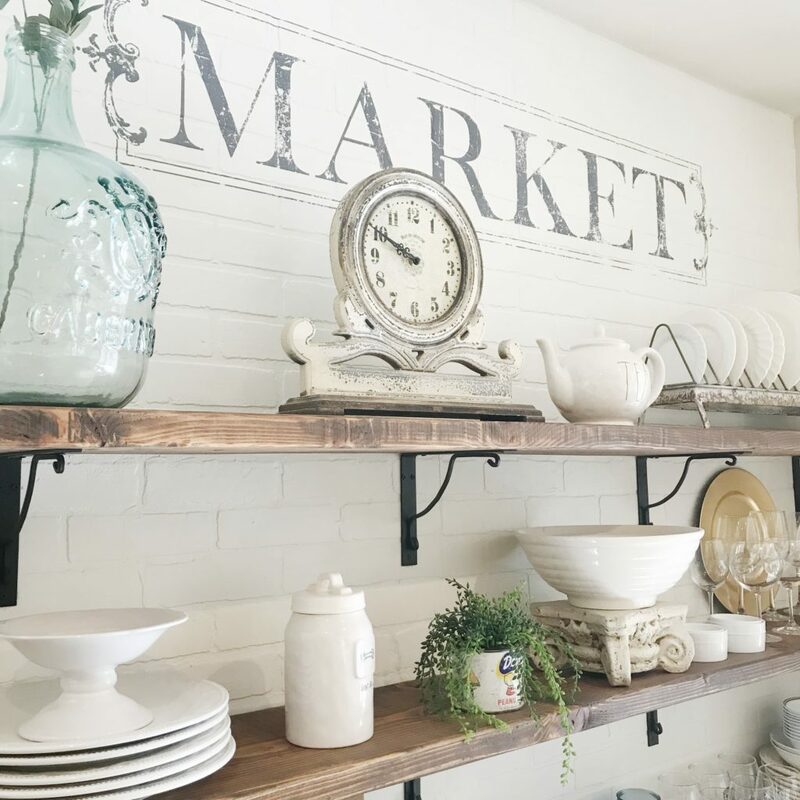 (sorry, I get swept away just at the thought of Washington) we decided that putting faux brick panels on this wall and painting them white would make a great wall for open shelves, and would be very charming….the plan is really coming together now. (which is a bit of problem when I find a great buy that is also a great BIG buy, but hey, it saves me money, right?) 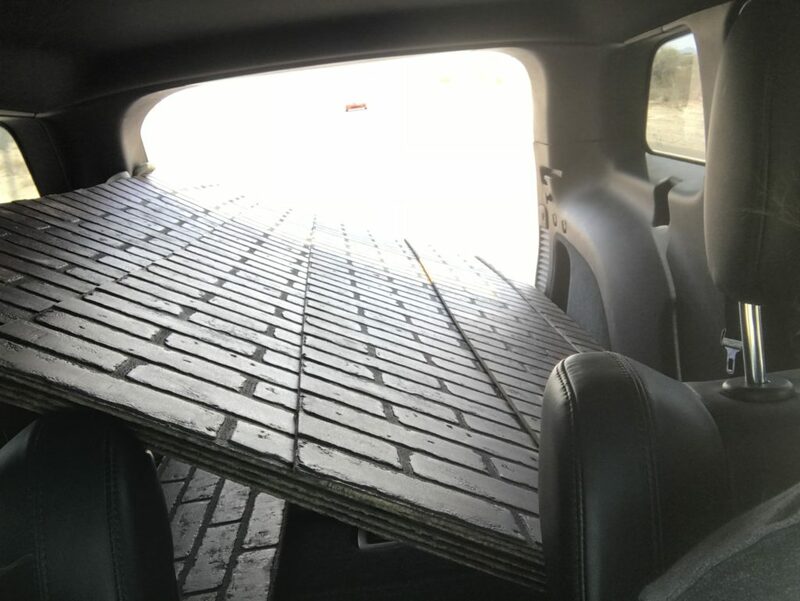 🙂 anyhoo, Home Depot carries these faux brick panels and they’re really very inexpensive, less than $30 for a 4 x 8 panel, so we bought 7! 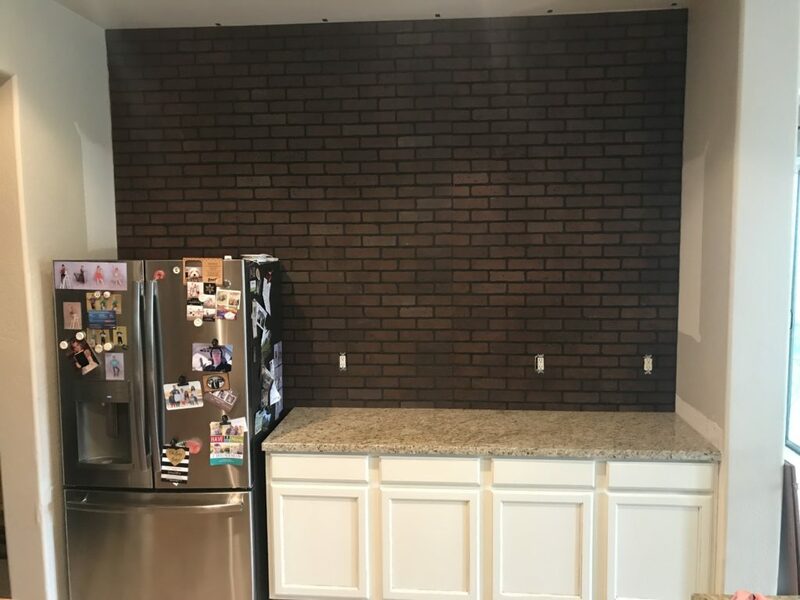 I know, it seems a little much for this wall, and it is, but once I got on the faux-brick train I just couldn’t stop thinking about all the places that we could add some character and charm to this house with brick. AND….we just happened to be getting ready to take a trip to the beach and had a rental car… a Jeep Grand Cherokee…so we decided to buy them all now while we had a vehicle they would fit in. Bringing home the brick! All 7 panels. Some we had cut at the store so we didn’t have to make all the cuts ourselves. and we’re so fortunate to have been gifted with tools that we use on a very regular basis. For this project we used a table saw, jig saw, cordless drill and barbecue spatula (see above). 🙂 Since we had the panels cut at Home Depot the only cuts we needed to make were for the outlets, as well as a few adjustments to make sure the pattern lined up. Thank goodness for Dee because that involves numbers and math and I am not good with either. Using our trusty stud finder we marked where all the studs were at the top and bottom of the wall using painters tape. That way we could be certain to screw these babies securely into studs. when removing the back-splash, those suckers are glued on tight! 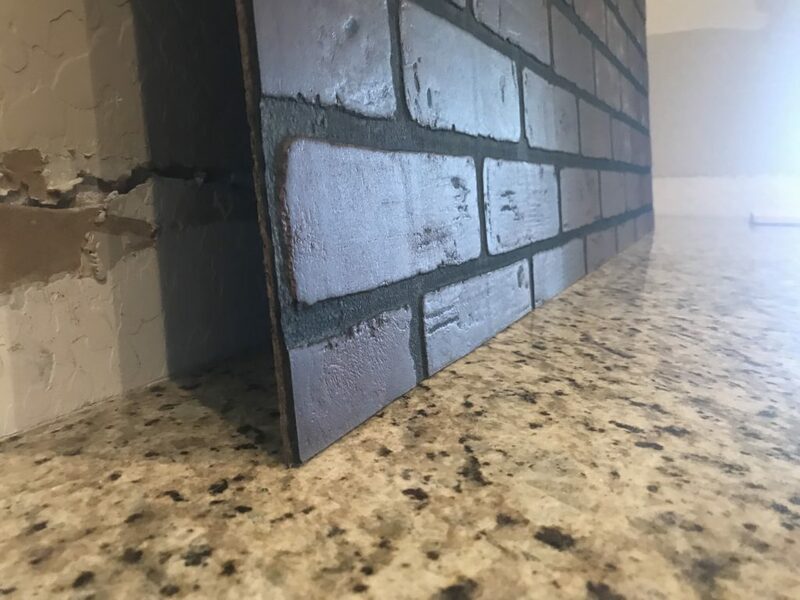 But i feel like this…it doesn’t hurt the integrity of the wall…and it’s going to be behind the brick panel so I see no need to worry about it, right? Well, right or wrong we moved forward and put the brick up right over the minor wall damage. Minor wall damage from removing the granite back splash. Dee put screws in the studs about every 16- 24 inches down the panel. In this photo you can see the seams where the panels come together, lining them up was a little tricky but a very important step. We wanted to make sure the pattern was consistent from one side of the wall to the other. The seams will be covered later in the process so we don’t worry about those at this point other than being very tight and perfectly vertical. You can see the seams in this photo and the heads of all the screws if you look closely enough, but those will be covered later. At the top of the photo on the wall you can see the blue tape which marked where the studs were. you know the kind, oozing charm and character and full of brick. But not just plain old brick, Brooklyn brownstones typically will have walls of brick that have been painted and patched and painted again and may even have areas where brick was removed and replaced. Generally, there’s nothing symmetrical about the brick in a Brooklyn brownstone, or any other old brick building for that matter. That is what I wanted for this wall…a Brooklyn brownstone kind of look. 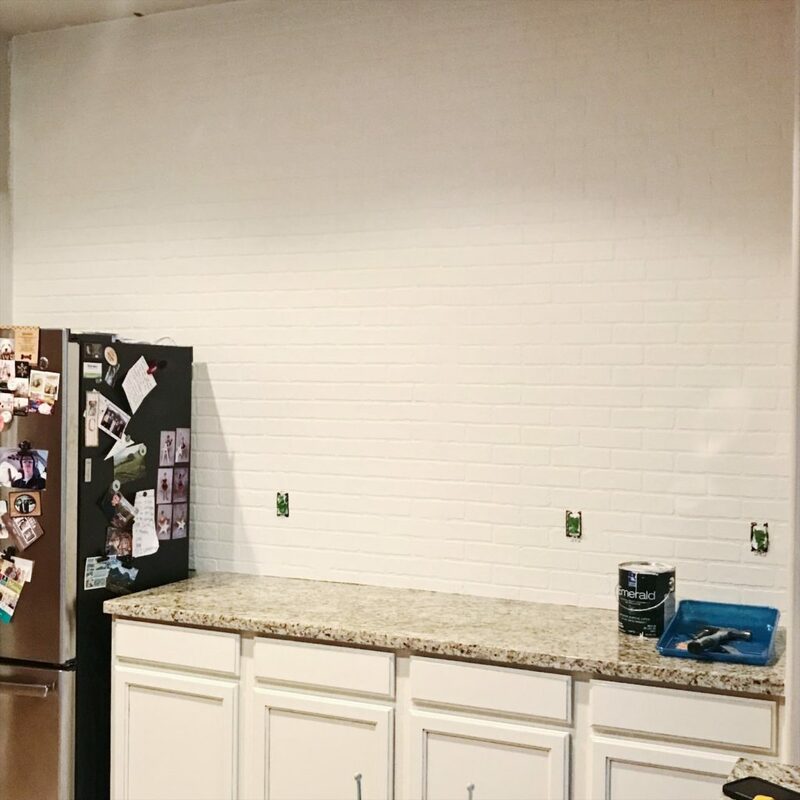 So I hopped on Pinterest, it’s what I do, and started searching for ways to make this perfectly symmetrical brick be not so perfect. 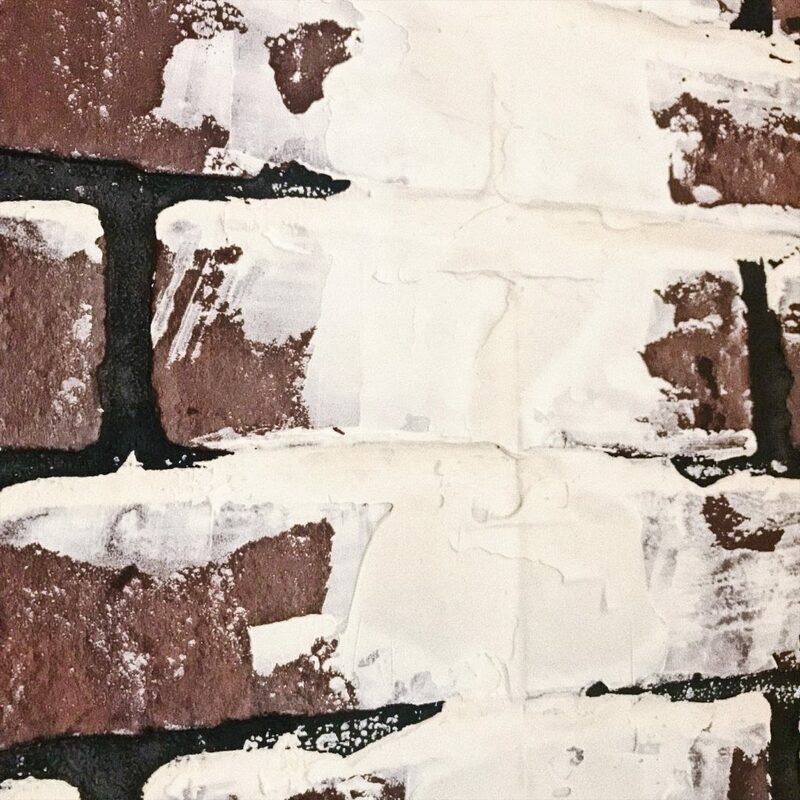 I ended up taking several how-to’s and blending and mixing until I came up with my own version of turning a faux brick panel into a Brooklyn brownstone wall. even though I had a few concerns about it cracking, because I know it will crack. However, I think cracks would make my wall look even more authentic so I went for it. You can get a bucket of joint compound at the hardware store for about $15 and it really goes a long way. I didn’t use the whole bucket for this wall…hows that for economical? Using a 6 inch metal trowel I loaded it up with the thick pasty stuff and just started slapping it on (clearly I had no idea what I was doing, so it was a learning process). I focused at first on covering the seams and the heads of the screws, it wasn’t quite as easy as it seemed in my head but the more I worked at it the easier it became. I made sure to put it on thick in some areas so that it would look like an authentic patch on an authentic wall. 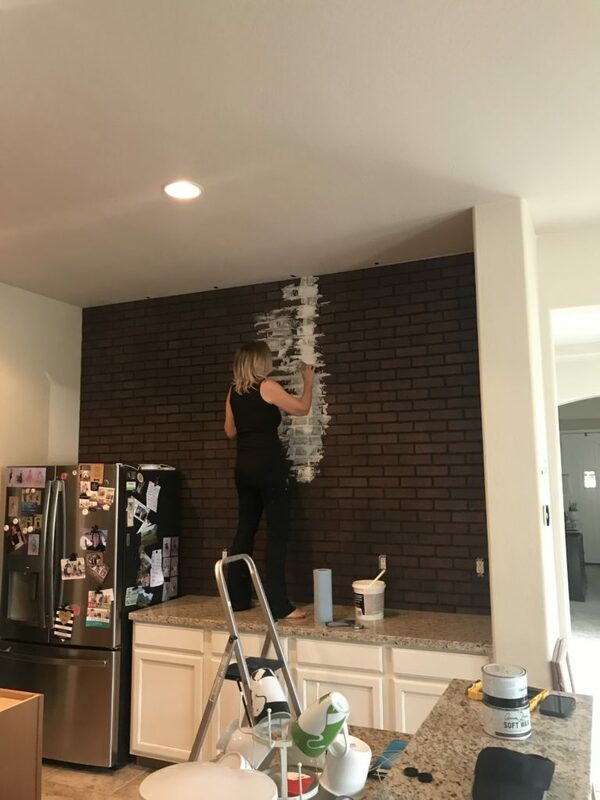 I soon discovered that by scraping it down the wall and then up the wall it added texture above and below the bricks so that the grout line was not so perfect. Yay! I did the same thing side to side to add texture to the ends of the bricks as well. The next step was paint! For my paint color I went with West Highland White in Matte finish by Sherwin Williams. 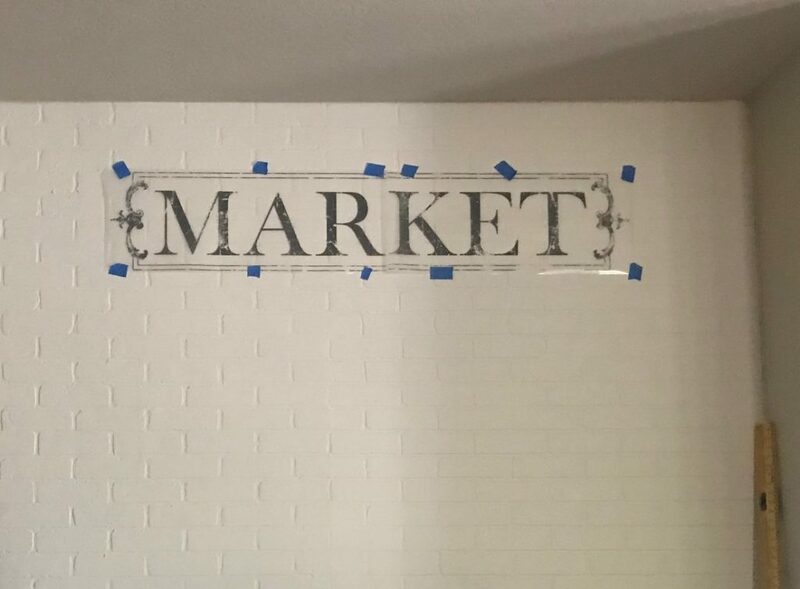 I went with the matte finish because I really wanted this wall to look old and authentic. I love the color, it’s a creamy warm white but just a smidge lighter than the Dover White which I used for the cabinets. I’m quite certain I will use this color throughout my house as I eventually lighten up my tan walls, however, I will probably get a close color match in a less expensive paint from Home Depot such as the Behr brand. I’ve used this paint before and trust it and since I had a 50% off coupon I decided to use it for this wall. I’m so happy with how my brick looks now that it’s textured and white. and I’m so glad this happened. Dee and I were perusing my favorite little local boutique, Grungy Galz, when he happened to notice a shelf of Iron-Orchid Designs Transfers. He picked up the MARKET box and said “I’ll bet this would look great up above the shelves on the brick wall.” I love that man! He was so right! This is a rub-on transfer, I used one before on my FARMHOUSE sign above my dining room hutch, and it’s super easy. Standing on a ladder while on a counter and reaching overhead makes it a bit more difficult but totally worth it. How fabulous is this sign??? It’s finally time for the shelves! We bought 3 2x12x10ft boards and had them cut to the length we needed at the store. I used Miss Mustard’s Milk Paint in Curio to make a wash with 1 part powder to 4 parts water. After sanding the boards to get any rough spots off and to soften the front edges a bit, I washed the paint mixture on and let it dry which only took about 30 minutes. I love this color made into a wash because, 1) you can control how dark or light you want it and, 2) you don’t have to mess with stinky, sticky stain. Easy Peasy! Once they were dry I wiped on a nice coat of Hemp oil and let it sit for a few minutes before rubbing it in with a fine grit sandpaper which makes the surface so smooth and silky. and super affordable at $5 each, especially when you need 12. I thought they were the perfect look for my kitchen with just a tiny bit of a swirl. Dee took care of securing the brackets to the studs and then the planks to the brackets and TAH-DAH!!!! Open Shelving!!!!! I LOVE IT!!! All that’s left to do now is style them! Open Shelving for the win!